This paper deals with comparative study of various types of optical fibers in non-destructive evaluation of different smart structures. Performance of single mode, high-birefringent, low-birefringent fibers, multifibers and plastic fibers embedded into concrete and composite structures are experimentally evaluated under different conditions. The results are discussed with respect to overall sensor performance and structural environment, which facilitates the selection of appropriate fiber sensor for a particular structure. The development of smart structures with embedded systems for monitoring structural health is fast becoming one of the most effective tools for non-destructive evaluation. Fiber optic sensors have played a significant role in smart structure applications [1-5]. Among the various optical sensor designs polarimetric fiber optic sensor (PFOS) has its unique advantages over the rest . Such a sensor typically employs a single Hi-Bi or bow-tie fiber, surface mounted or embedded into the structure with a minimum effect on the structures . Since PFOS is highly sensitive to the perturbations over its entire sensing length, global health monitoring is possible. In the case of a polarimetric sensor, changes in the state of polarization of the light traveling in a single-mode optical fiber are used to determine the measureand (strain, stress, temperature etc.) imposed on the sensor. Optical fibers play a major role in the design of non-destructive testing tools and for such applications selection of a suitable fiber for a particular structure is equally important. In this paper we are presenting our experimental results on various types of optical fiber sensors embedded into different types of engineering structures. All these sensors are studied in polarimetric sensor configuration. Performances of single mode(SM), high-birefringent(HB), low-birefringent( LB) fibers, multifiber(MF) and plastic fiber(PF) embedded into composite and concrete structures are experimentally evaluated under different conditions. The results are useful in selecting the appropriate fiber sensor for a particular smart structure. where d = Dbo L/2 which denotes the initial phase. Any phase shift corresponds to the measured strain. The output intensities are cosine square functions of birefringence. For high-speed dynamic strain changes, application of second harmonic or the measurement of change in fundamental frequency of the specimen under test provides the information on healthy state of the structure. SOP = (D1 - D2)/ (D1 + D2). When SOP = ± 1, the output light is linearly polarized and when SOP = 0 the output is circularly polarized. The dynamic response of the system is recorded under the impact loading using an impact hammer. 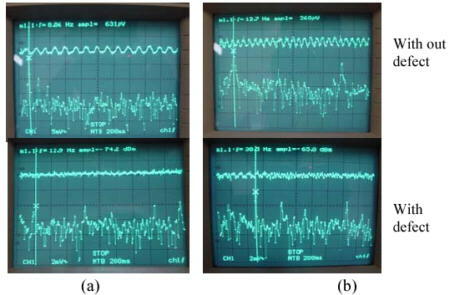 The Fourier transform is taken simultaneously and recorded for detail analysis. The experiments are conducted on healthy and unhealthy samples. Experiments were conducted on composite and concrete specimens with and without defects. Polymer composite materials offer high compatibility with fiber optic smart structures and they are extensively used in aerospace structures. In our work static measurements are done only on composite structures. In static.case the specimen was loaded progressively in a 3-point bending fixture and the SOP was recorded as a function of applied load. The SOP is found to vary sinusoidally with increasing load as expected. Fig. 1 shows the response curves of the HB, LB, SM and a combination of SM and HB polarimetric fiber optic sensors for the defective and healthy GFRP composite specimens. It can be seen that the amount of applied load required to produce one SOP cycle increases with the presence of delamination/defect in the specimen. Fig. 1. Static response curves for (a) HB fiber (b) LB fiber (c) SM fiber (d) MF sensor with 45 o input polarization (e) MF sensor with 0 o input polarization (curve 1 for healthy specimen and curves 2, 3 for defective specimens). It is also observed that in the case of HB fiber sensor, small applied load can create a significant change in the output SOP whereas large applied loads are required to create SOP changes in the case of LB and SM fiber sensors. This is due to the fact that HiBi fibers have built-in stress birefringence and hence is more sensitive to the external perturbations. Defining a parameter, Quality factor 'Q' as equal to the load required per unit SOP cycle to characterize the health of a structure, it is observed that Q-factor reduces due to the presence of defects/ delamination within the structure. This change can be attributed to the fact that the presence of defects causes a change in the flexural stiffness of the materials. When a multifiber assembly of a PM fiber, spliced to a Hi-Bi bow-tie fiber has been introduced for strain sensing in composite structures, the performance was improved, as compared to the same individual fibers. However this improvement depends on the initial polarization of the input light. Detail analysis of polarization behavior of the combined fiber and experimental results can be found in ref. . The dynamic response of the LB, HB, SM and MF were recorded for the same composite specimens and also on concrete specimens. An impact hammer is used for dynamic loading. Fig.2 shows the typical responses of the PFOS with various types of sensing fibers for healthy and unhealthy composite specimens. The presence of defects in the structure manifests as a change in the flexural stiffness of the material leading to a shift in fundamental frequency as illustrated in Fig.2. Frequency shift is indicated by the position of the cursor line in the combiscope signal. Though the dynamic responses of all the sensors used are similar, the FOPS shows a very pronounced frequency shift in the case of HB fiber. The frequency shift depicted by LB and SM fibers are comparatively less, which indicates the limitation of the sensitivity of other two fibers in picking up the defect levels in the structure. However in dynamic case, a poor response was observed when a MF sensor is introduced into the structure. Many other factors such as fiber coating, pre-stress, input azimuth and fiber turns also affect the performance of PFOS. In composite structures the frequency shift is due to the inter-ply debonding or delamination in the laminates. The distinct frequency shift clearly shows that the change in flexural stiffness is reflected in the overall dynamic behavior of the structure and is effectively picked up by the embedded PFOS. The studies are carried out with different defect specifications to the laminate. A similar frequency shift is observed in all cases. This technique can even be extended to monitor the development of defects and defect propagation in composite structures. The mechanism of axial strain transfer from a composite laminate to the embedded fiber sensor can be found in ref.[12,13]. Fig.2. The dynamic response signals of (a) SM fiber (b) LB fiber (c) HB fiber (d) MF sensors embedded in composite structure. For concrete we have tested LB, HB, SM, MF and PF sensors for no-destructive evaluation. The dynamic response of the glass fiber sensors are recorded by embedding jacketed and.uncoated/stripped fibers. Fig.3 shows the dynamic responses of LB and HB fibers. For other fibers the signal was comparatively weak. Though the fiber without acrylate coating inside the concrete shows the similar sensitivity as that of composite, in the case of concrete specimen there is a high probability of fiber breakage inside the structure while curing. A suitable protective coating has been applied in our investigation, which reduces the sensitivity of the polarimetric sensor. Also the asymmetric stress distribution developed after curing would lead to additional birefringence in the fiber, which is a source of variation in sensor performance. For actual structural health monitoring the choice of fiber coating material is also important. Detail theoretical analysis of the embedded fibers in concrete structures can be found in ref.14. An efficient protective coating on the fiber would improve the sensor response and concept can also be extended to monitor the crack propagation in civil structures. Fig 3.The typical dynamic response of (a)LB fiber (b) HB fiber sensors embedded in concrete structure. To avoid fiber breakage we have tried a plastic fiber sensor and the results are reasonable. We have studied two types of PF sensor configurations embedded into the concrete specimen. One is a straight and the other is single loop configuration. The dynamic response of the sensor was recorded for specimens with and without defect. Fig.4 shows the typical responses of the PF sensor for healthy and unhealthy specimens of concrete structure. Though the dynamic responses of the two configurations are similar, the single loop configuration shows a slightly pronounced frequency shift and better visibility. This may be attributed to longer sensing length and also to the resonance effect due to looping. The distinct frequency shift clearly shows that the change in overall stress distribution is reflected in the overall dynamic behavior of the structure and is effectively picked up by the embedded sensor. The studies are carried out with different specifications to concrete block and various defect forms. A similar frequency shift is observed in all cases. Fig. 4. Typical dynamic response of the embedded POF sensor for loop fiber configuration in concrete specimen With defect Without defect.This technique can even be extended to monitor the development of cracks and crack propagation. The sensor response was verified by embedding both jacketed and uncoated/stripped plastic fibers. Both fibers showed similar sensitivity. Hence it is not necessary to remove the fiber jacket. The advantage of using POF sensor is that there is a very little possibility of fiber breakage inside the structure while curing. Hence it avoids the need for a suitable protective sleeve for the sensor. LB, HB, SM and MF fibers have been successfully implemented for structural health monitoring of composite under static and impact dynamic loading conditions. All these fibers sensors and PF sensor have been implemented for nondestructive evaluation of concrete structure under dynamic loading. The feasibility of using various fibers in PFOS configuration to detect the damage/delamination in composite and concrete is compared. It is concluded that the HB sensor shows a better sensitivity both in static and dynamic conditions as compared to LB and SM fibers. The results indicate that HB fiber is the most suitable fiber for PFOS applications. A MF sensor using SM-HB is also a better sensor as compared to individual LB and SM fibers. The POF sensor has been successfully implemented for structural health monitoring of concrete under impact dynamic conditions. In spite of its lesser sensitivity as compared to glass sensors, it can be efficiently used when the fiber breakage is a serious problem. The system performance can be improved using the loop fiber configuration. Eric Udd, Fiber Optic Smart Structures, Wiley Series in Pure and Applied Optics, 1995. D.A. Krohn, Fiber Optic Sensor. Fundamentals and Applications, Instruments Society of America, 1998. Eric Udd. Fiber Optic Sensors. An introduction for Engineers and Scientists, Wiley Series in Pure and Applied Optics, 1990. Raymond M. Measunes, Structural Monitoring with fiber optic technology, Academic Press, 2001. K.T.V. Grattan, B.T. Meggitt, Optical Fiber Sensor Technology, Kluwer academic publishers, 1999. A.W.Domanski, T.R.Wolinski, W.J.Bock, "Polarimetric Fiber Optic Sensors: State-of-the-Art and Future", Proc.SPIE, vol. 2341, 21-26, 1995. W.J.Bock, T.Rwolinski, and A.Barwich, " Development of a polarimetric optic fiber sensor for electronic measurements of high pressure", IEE Trans. Instrum. Meas., 3, pp.715-721, 1990. A.W.Damanski, A.Gorecki and M.Swillo, "Dynamic strain measurements by the use of the polarimetric fiber optic sensors" Proc. IEEE, 2615-6, pp. 816-819, 1995. Gopalkrisha. Hegde and Anand Asundi, "Performance of a fiber optic polarimetric sensor in health monitoring of different smart structures", Proc. ISSS-SPIE pp.691-695, 2002. L.K. Wai, A.Peiyi, C.Fai, H.Jianheng, Shelley John, Anand Asundi and Gopalkrishna Hegde, "Sensitivity analysis of all fibers in polarimetric fiber optic sensor for structural health monitoring of composites", Proc. SPIE-NDE, vol.5046, pp.362-367, 2003. Gopalkrishna Hegde * , Eluska Sukia, Lim Choo Min and Anand Asundi, "Performance of a multi-fiber polarimetric strain sensor", SPIE, vol.5458, pp.129-135, 2004. M.S.Miller, S.W.Cause, G.P.Carman,,C.A.Schmid, R.G.May, and R.O.Claus, "Validation of axial strain transfer from a composite laminate to embedded optical fiber sensors",SPIE Proc.1798, pp.19-29,1992. F.Ansari and J.Wang, "Rate sensitivity of high birefringent fiber optic sensor under large dynamic loading" J.Lightwave Tech. 13, no.10, pp. 1992-1997, 1995. J.Calero, Sou-Pan Wu, Clark Pope, S.L.Chuang, "Theory and experiments on birefringent optical fibers embedded in concrete structures", J. Lightwave Tech. 12 ,no.6, pp.1081-1091, 1994.